Definition – A bay window is a 3 section window with a larger center window (usually a non-operable fixed window) and two equal sized side windows (usually they are operable crank out casement or double hung styles). The side windows are set at angles (30, 45, 60 & 90 degrees are most common). The window sizes can vary from 30” to 144”. Additional Light & Space – Since the windows protrude they capture light from multiple directions. Bay windows usually have a window seat to provide additional room to read a book or enjoy something to eat. Increase views, vision and resale value – Take advantage of panoramic views of your front, back or side yards with this angled window design and increase the market value of your home as well. Improve breezes and air flow– Using operable casement or double hung windows the angled portion of the bay window can capture breezes – which will help you to get rid of cooking smells quicker or make the air in any room fresher. Window treatments are more difficult to install – The angled windows make it harder to mount hardware. This problem can be solved by adding blinds inside the windows. Higher cost window – Since the bay window has a roof and a seat (window box) it’s construction is more extensive making it more expensive than a standard window. Windows are more exposed to the elements – Since the grouping of windows included in the bay stick out from the home they have increased exposure to rain, heat and the cold. 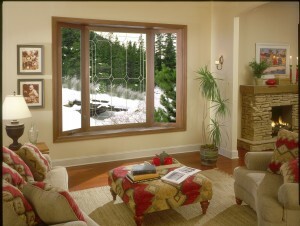 Decorative and energy star windows. 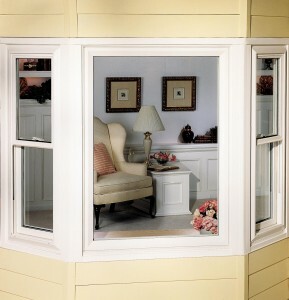 You’ll find bay windows most frequently used in kitchens, dining room, breakfast nooks, living room and master bedrooms. They can be designed to work with any decorating style from Frank Lloyd Wright to Modern to Victorian. Do you have any questions or advice about using a bay window? If so please comment below. To learn more about wood or vinyl bay windows or to get free consultation contact Cleveland Window Company (216-531-4118) or Clear Choice Window & Door in Columbus (614-545-6886) or in Cincinnati (513-744-2184) – divisions of Innovate Building Solutions. Vinyl or Wooden Crank out casement windows – are they your best replacement window choice?